According to W. B. Yeats, Romantic Ireland’s dead and gone* but I’m not so sure after reading reports of a new book called The Legendary Casey Brothers. 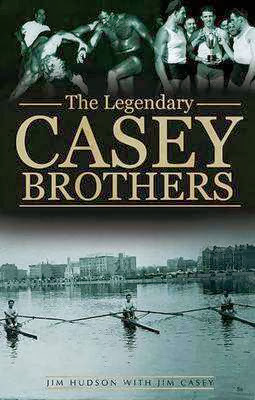 In an updated edition of a book originally published in the USA about the Casey family from Sneem, County Kerry, author Jim Hudson tells the story of seven brothers who rowed successfully at home on the Lakes of Killarney, and in both London and Boston as well as becoming folk heroes in the world of professional wrestling. In 1982 the seven Casey brothers were inducted into the Irish Sports Hall of Fame, the only family ever to receive that honour. The brothers, from Sneem in County Kerry, starred as Olympic-class oarsmen, Tug-of-War champions, professional wrestlers and boxers and won fame throughout the sporting world. Steve, known as ‘Crusher’ Casey, became the supreme wrestler in the world and for a decade no one could match him. When he turned to boxing, the great Joe Louis refused to go into the ring with him. 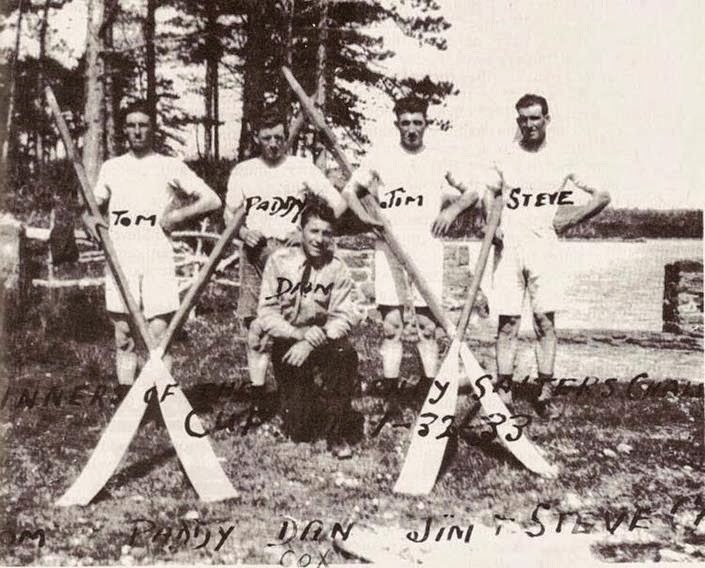 In 1983 at a family reunion in Sneem, five brothers, all in their seventies, climbed into the four-oar boat they used to win championships in the 1930s. Although they had not rowed together in fifty years, they still moved with their former natural unity. Sports people from Kerry have achieved fame in many fields but the success of the Caseys surely outshines all. · And, of course, probably the greatest of them all, Steve ‘Crusher’ Casey became the supreme wrestler in the world and he retired undefeated as world wrestling champion. But before that he led the Sneem crew to their three successive Salter Cup victories, thereby winning the cup outright; he rowed successfully in London. The Irish Times recently reviewed the book in an article called "The Dream Team from Sneem". 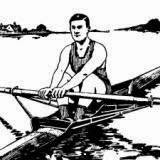 In the book you can read about their early life in Kerry rowing traditional boats and winning the coveted Salters Cup at Killarney Regatta three times in 1930, 1931 and 1933 (no regatta in 1932); their move to London and their successes there with Ace Rowing Club and their bid to row at the 1936 Olympic Games (* see opening paragraph above!) which was foiled owing to their earnings from professional wrestling. Tom, Jim and Steve Casey (l. to r.) on the Charles River, Boston, Massachusetts. 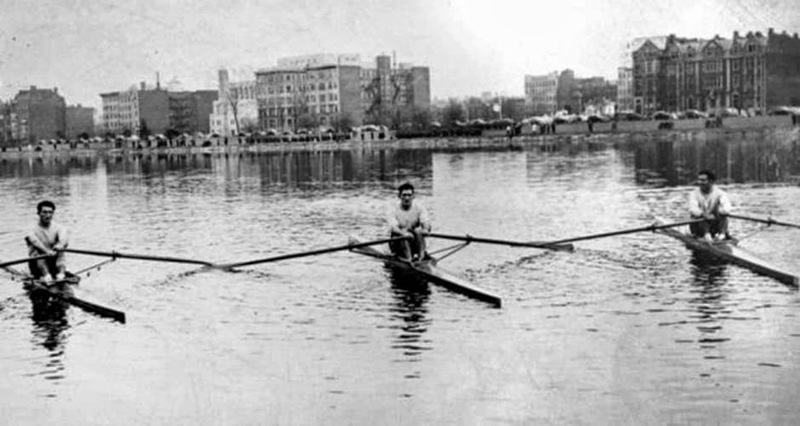 Among the club’s more colorful oarsmen was Steve “Crusher” Casey. 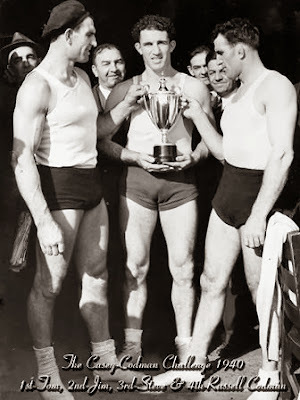 An immigrant from Skibbereen, County Kerry, a professional wrestler and boxer, and a Boston icon, Steve and two of his seven brothers raced victoriously for Riverside throughout the 1930’s and 40’s [sic]. In testimony to his popularity on both sides of the Atlantic, his statue stands today in his hometown, while in this country his bars, Casey’s on Huntington Avenue near Boston Symphony Hall and Casey’s Too in Hull, were favorite watering holes for locals, Irish immigrants and rowers alike. 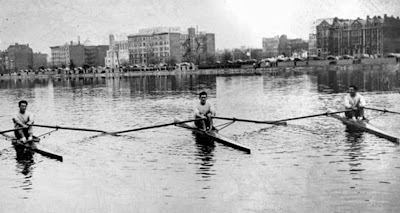 Four years afterward (1940), three of the brothers went some way to proving their point, when they challenged all-comers to a single skulls (sic) race on Boston’s Charles River. Only one of America’s best rowers, Russell Codman, was brave enough to accept. Watched by a quarter-million spectators, he was beaten into fourth place. The Dorchester Reporter has more details on the challenge issued by the Casey brothers and the race with Codman. 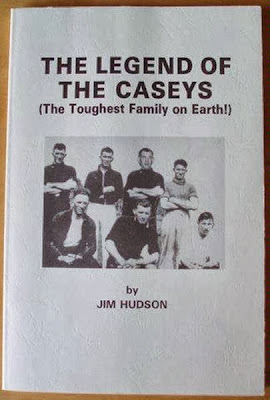 The original book by Jim Hudson was published privately in the USA in 1990 and was called The Legend of the Caseys (The Toughest Family on Earth!). For the new edition of the book, Radio Kerry presenter and former GAA referee Weeshie Fogarty and Kerry-based videographer Christy Riordan travelled to Texas to meet with Myrtle Casey, Jim Casey’s wife. “They're all gone now, and there isn't anything more the sea can do to me”; these were the immortal lines from Maurya, (the spelling used by Synge) the mother in Synge’s Riders to the Sea, as she was ‘caoining’ the death of her sons. This quotation surfaced when I read a new book from The Collins Press, The Legendary Casey Brothers. Written some years ago about the legendary seven Casey brothers from Sneem, it will be launched in The Sneem Hotel by Olympic gold medallist Ronnie Delany on October 18. Written by Jim Hudson some years ago it is based on interviews with Jim Casey and his wife Myrtle in Texas telling the story of the seven legendary world champion brothers from Sneem. The author is now deceased [sic ~ see Comment No. 1 below!] and so is Jim Casey, but his wife, 92 year old Myrtle is coming out of a nursing home and travelling to Sneem for the launch. When Myrtle was on holidays in Sneem some years ago she was put in touch with Radio Kerry’s Weeshie Fogarty and Christy Riordan. She wanted the Casey brothers’ story to be published so she invited Weeshie and Christy to her home in Texas in 2008 and gave them access to all the memorabilia and documents, including the unpublished book. This duo proved the catalyst for the publication and Collins Press took up the challenge. 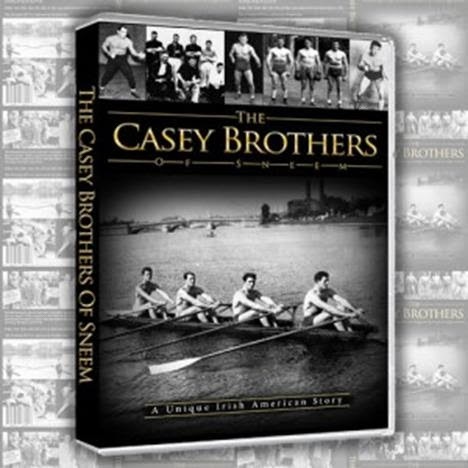 Christy Riordan has also produced an excellent DVD on The Casey brothers of Sneem. You can look inside the book here and check out the DVD and watch a seven minute trailer here. Jack’s son, Noel, was a successful rower and coach with Vesta Rowing Club, but is best remembered for his time with Thames Rowing Club; particularly coaching amongst others, his daughters Bernadette and Caroline to many national successes and to seventh place for Great Britain at the World Rowing Championships held in Munich in 1981. He also coached the Great Britain women’s eight to a fifth place finish at the 1984 Los Angeles Olympic Games. Bernadette Casey Carroll now lives in Baltimore, Maryland, and her children Jack and Victoria are according to The Kerryman deeply involved in sports including rowing and have competed in England at a very high level. ‘Romantification’ aside, I’m looking forward to reading the book and learning more about this extraordinary family. The DVD The Casey Brothers. I am the eldest son of Jim Hudson. The man that wrote The Legend of the Caseys. I am very pleased to report that my father is not only still alive, today happens to be his 84th birthday. His bride of 63 years is also still by his side. Chris ~ thank you for this information and many warm congratulations to your father on his 84th birthday! 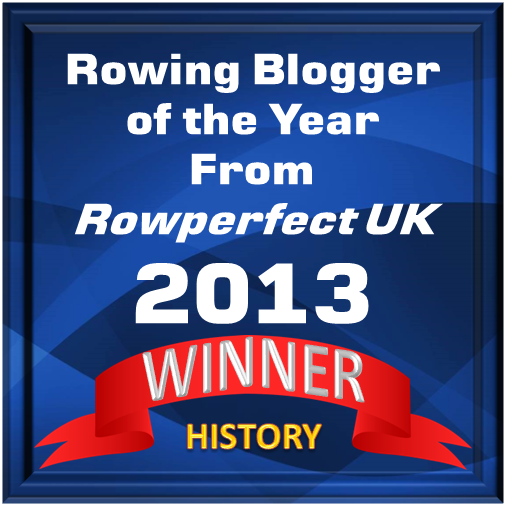 Daniel James Brown: "Rowing is Beautiful..."